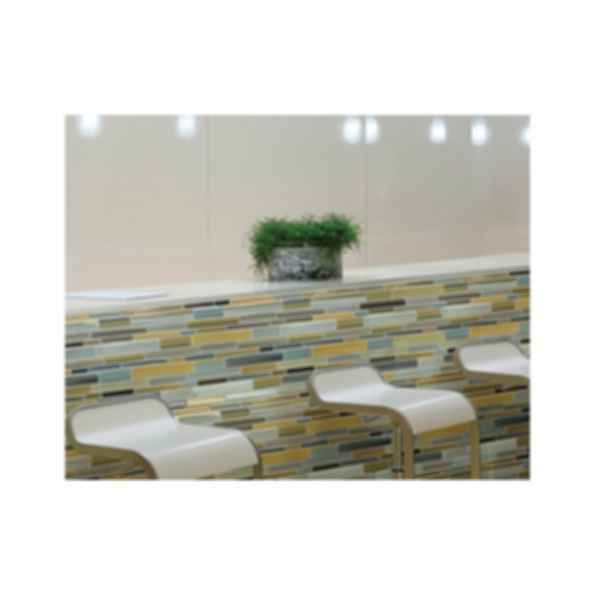 VitraArt Fusion glass tile mosaics from Florida Tile inspires your inner beauty. Featuring 8 distinguished colors and in a format that is quickly becoming the most popular size in our mosaic line, a 12"x12" random strip pattern (RSP). Designed to be a one-stop solution to coordinate with the entire breadth of our porcelain and stone product lines, the palette is a unique blend of tone-on-tone contrast with slight shots of color creating an exciting installation. From backsplash, accent wall, showers and baths, this line has the basics covered with 4 neutral tones in Ice, Sand, Clay and Plantation which will subtly accent a more classic design space. For a more bold accent in contemporary or commercial design spaces we developed 4 slightly contrasting, but complementary, color combinations in Carbon, Oxide, Rock and Erosion. VitraArt Fusion is durable and contains 40% recycled content, it can also be used for both residential and commercial installations.